Two Russian cosmonauts will venture outside the International Space Station this month in a second bid to install two high-definition cameras on the exterior of the orbiting lab, the Vancouver-based company UrtheCast announced Monday (Jan. 13). Officials with UrtheCast (pronounced "Earth cast") say the spaceflyers will try again on Jan. 27 to install the company's Earth-watching cameras after a technical glitch marred an initial attempt last month. During a long spacewalk on Dec. 27, 2013, Russian cosmonauts Oleg Kotov and Sergey Ryazanskiy successfully installed UrtheCast's two cameras outside the space station. But before the cosmonauts went back inside the orbiting lab, they had to remove and return the cameras to storage because mission controllers in Moscow were unable to confirm the devices were receiving power from the space station due to a cabling problem. "With the ISS cabling issue now resolved, we expect that the second spacewalk will result in a complete installation," UrtheCast CEO Scott Larson said in a statement. "We're now confident that our business plan will remain unaffected." UrtheCast's cameras are designed to beam detailed views of Earth from space in near real time to the company's partners and customers on the ground who might be might be monitoring the environment, natural disasters, agricultural land and other features and events on the planet. 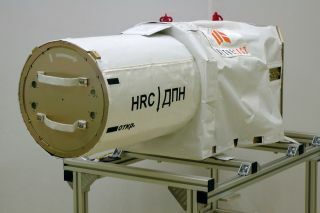 The cameras arrived at the space station in November as part of the unmanned Russian Progress 53 cargo delivery.